Sun City Riverbend is an upscale waterfront community within the greater development of Sun City Hilton Head devoted to residents 55 and over. Known for excellent golf and classic Lowcountry scenery, Sun City Hilton Head offers a stimulating lifestyle of recreation and socializing. The Sun City Riverbend enclave has its own private gated entrance and a distinct feeling of luxury and security. Send me more information about Riverbend! There are three 18-hole championship golf courses within the 5,600 acres of Sun City Hilton Head. The Okatie Creek Golf Club and Hidden Cypress Golf Club were designed by PGA Tour veteran Mark McCumber. The courses offer lush greens and extensive waterways that provide an exciting and memorable round of golf for both experts and beginners. The newest 18-holer–Argent Lakes executive course–is also available for golf enthusiasts. Send me more information about Riverbend! A 45-acre Village Center at the heart of the Sun City Hilton Head boasts an amenity campus that’s unsurpassed. The Town Square is anchored at one end by The Pinckney Social Hall, a 17,000 square-foot venue with a ballroom. The Town Square hosts lectures, workshops, dances and concerts. At the other end of the square is The Purrysburg Fitness Center. Here you’ll find a state-of-the-art fitness facility, indoor and outdoor pools and cushioned-floor aerobics studio. The Yemassee Crafts Center building is also located on the square and includes studios for ceramics, arts and crafts, sewing and photography. Send me more information about Riverbend! Residents have access to a full complement of local and visiting culture events at Magnolia Hall—a 16,000-square-foot performing arts center. Featuring stadium-style seating for 540 people, it plays host to a variety of theatrical performances, lectures and concerts. The Hidden Cypress Fitness Center is a workout facility that overlooks the beautiful Hidden Cypress Golf Course. It includes a state-of-the-art fitness center, meeting rooms, outdoor pool and restaurant. There is also a large woodworking shop with an area for model railroad enthusiasts. Send me more information about Riverbend! Construction of the final amenity center was completed in 2012. This new state-of-the-art venue has an indoor and outdoor pool, and more bocce ball, tennis and pickleball courts. The grounds are an active adult playground adorned with 12 Har-Tru tennis courts, a softball field, pickleball and bocce ball courts, a dog park and outdoor party pavilion. Water activists have a place of their own as well. Lake Somerset is a 20-acre fishing lake set within Sun City Hilton Head that offers great catch and release fishing. The lake provides gorgeous views and remote controlled sailboats are a common site. 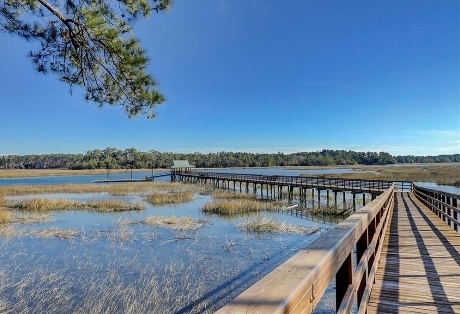 Elevated boardwalks and miles of walking and biking trails meander through acres of oaks, pines and wetlands. Send me more information about Riverbend! Send me more information about Riverbend! Full-time Lifestyle Director to help plan special events and activities. Since 1995, Sun City Hilton Head has been one of the most acclaimed active-adult communities in the country. It is nestled in the semi-tropical low country of South Carolina where unspoiled sea marshes meet tall pines and ancient oaks. The mild marine climate has a yearly average temperature in the 70s that makes outdoor activity comfortable throughout the year. Send me more information about Riverbend! Sun City Riverbend is located in the historic Lowcountry town of Bluffton, SC, just a dozen miles west of world-famous Hilton Head Island. The area is renowned for great beaches, famous golf courses and unique boutiques. The Okatie Center, a 268-acre shopping and commercial center adjacent to Sun City, is accessible via golf cart. It includes banks, hotels, restaurants, a grocery store and more. Several miles away, Berkeley Place is home to the Cinemark Theater and great shopping and dining outlets. And, of course, Hilton Head Island itself along with the surrounding area features many cultural and recreational attractions. Send me more information about Riverbend!